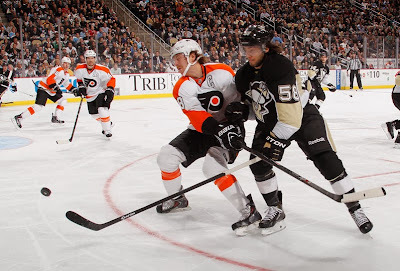 Last night the Penguins took on the Flyers at home.. We lost 2-1.. Can I go back to bed? Oh yeah, The flyers would opened the scoring when Brayden Schenn put a wrist shot behind Fleury at 16:02. And that would be the score heading into the second. A much more even period. The Flyers had the upper hand 10-9 in shots. 6:59 seconds into the period Jay Rosehill took a Interference penalty against Craig Adams. Shortly before that penalty expired Sidney Crosby FINALLY scored a goal (I was excited as a Penguins fan and as a Fantasy Hockey guy who drafted Sid first overall) to tie the game 1-1. 17:10 into the period Pascal Dupius would get called for Slashing agains Claude Giroux. It appeared that Giroux's golf hand was hurt on the play but upon review that Giroux was practicing his John Cena impression triyng to over sell the slash. Both Bortuzzo and Hartnell also took penalties on the play so Pittsburgh would head to the Penalty Kill. On the power play Schenn would score his second goal of the game which would also be the deciding goal. Sean Couturier took a penalty for tripping Crosby was really the only notable thing in the period. The Penguins out shot the Flyers 6-3. That is about it... We lost to the Flyers which never feels good. Our next game is Friday when we host Nashville. The game is set to start just after 7. Lets hope we can turn things around and end this losing streak. I would probably hold my breath as well..
All the ladies like Letang. The Flyers won 34 of 61 faceoffs. Crosby was %41 in the faceoff circle.. 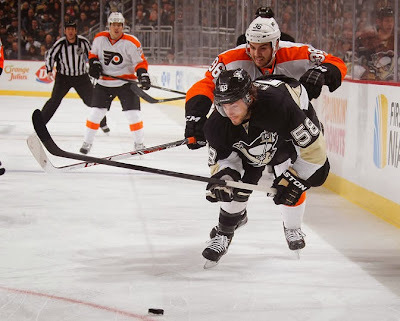 I hated covering losing to the Flyers %100 of the time when writing this.